This quickstart runs an Azure Batch job from a C# application built on the Azure Batch .NET API. The app uploads several input data files to Azure storage and then creates a pool of Batch compute nodes (virtual machines). Then, it creates a sample job that runs tasks to process each input file on the pool using a basic command. After completing this quickstart, you will understand the key concepts of the Batch service and be ready to try Batch with more realistic workloads at larger scale. Visual Studio 2017, or .NET Core 2.1 for Linux, macOS, or Windows. A Batch account and a linked Azure Storage account. To create these accounts, see the Batch quickstarts using the Azure portal or Azure CLI. Click All services > Batch accounts, and then click the name of your Batch account. To see the Batch credentials, click Keys. Copy the values of Batch account, URL, and Primary access key to a text editor. To see the Storage account name and keys, click Storage account. Copy the values of Storage account name and Key1 to a text editor. Navigate to the directory that contains the Visual Studio solution file BatchDotNetQuickstart.sln. To simplify the example, the Batch and Storage account credentials appear in clear text. In practice, we recommend that you restrict access to the credentials and refer to them in your code using environment variables or a configuration file. For examples, see the Azure Batch code samples repo. Right-click the solution in Solution Explorer, and click Build Solution. Confirm the restoration of any NuGet packages, if you're prompted. If you need to download missing packages, ensure the NuGet Package Manager is installed. Then run it. When you run the sample application, the console output is similar to the following. During execution, you experience a pause at Monitoring all tasks for 'Completed' state, timeout in 00:30:00... while the pool's compute nodes are started. Tasks are queued to run as soon as the first compute node is running. Go to your Batch account in the Azure portal to monitor the pool, compute nodes, job, and tasks. Typical execution time is approximately 5 minutes when you run the application in its default configuration. Initial pool setup takes the most time. To run the job again, delete the job from the previous run and do not delete the pool. On a preconfigured pool, the job completes in a few seconds. Uploads three small text files to a blob container in your Azure storage account. These files are inputs for processing by Batch. Creates a pool of compute nodes running Windows Server. Creates a job and three tasks to run on the nodes. Each task processes one of the input files using a Windows command line. Displays files returned by the tasks. See the file Program.cs and the following sections for details. 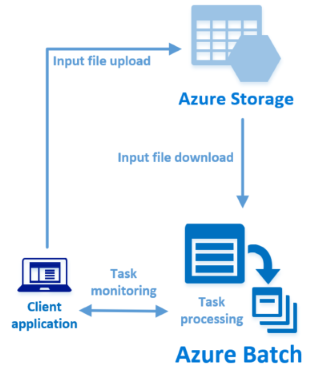 To interact with a storage account, the app uses the Azure Storage Client Library for .NET. It creates a reference to the account with CloudStorageAccount, and from that creates a CloudBlobClient. The app uses the blobClient reference to create a container in the storage account and to upload data files to the container. The files in storage are defined as Batch ResourceFile objects that Batch can later download to compute nodes. To create a Batch pool, the app uses the BatchClient.PoolOperations.CreatePool method to set the number of nodes, VM size, and a pool configuration. Here, a VirtualMachineConfiguration object specifies an ImageReference to a Windows Server image published in the Azure Marketplace. Batch supports a wide range of Linux and Windows Server images in the Azure Marketplace, as well as custom VM images. The number of nodes (PoolNodeCount) and VM size (PoolVMSize) are defined constants. The sample by default creates a pool of 2 size Standard_A1_v2 nodes. The size suggested offers a good balance of performance versus cost for this quick example. The Commit method submits the pool to the Batch service. A Batch job is a logical grouping of one or more tasks. A job includes settings common to the tasks, such as priority and the pool to run tasks on. The app uses the BatchClient.JobOperations.CreateJob method to create a job on your pool. The Commit method submits the job to the Batch service. Initially the job has no tasks. The app creates a list of CloudTask objects. Each task processes an input ResourceFile object using a CommandLine property. In the sample, the command line runs the Windows type command to display the input file. This command is a simple example for demonstration purposes. When you use Batch, the command line is where you specify your app or script. Batch provides a number of ways to deploy apps and scripts to compute nodes. Then, the app adds tasks to the job with the AddTask method, which queues them to run on the compute nodes. The app automatically deletes the storage container it creates, and gives you the option to delete the Batch pool and job. You are charged for the pool while the nodes are running, even if no jobs are scheduled. When you no longer need the pool, delete it. When you delete the pool, all task output on the nodes is deleted. When no longer needed, delete the resource group, Batch account, and storage account. To do so in the Azure portal, select the resource group for the Batch account and click Delete resource group. In this quickstart, you ran a small app built using the Batch .NET API to create a Batch pool and a Batch job. The job ran sample tasks, and downloaded output created on the nodes. Now that you understand the key concepts of the Batch service, you are ready to try Batch with more realistic workloads at larger scale. To learn more about Azure Batch, and walk through a parallel workload with a real-world application, continue to the Batch .NET tutorial.